Original Sin Research Papers delve into the Catholic definition of this term, and how it effects all the descendants of Adam and Eve. Research papers on original sin look at the Biblical perspective of various religions and their idea of what original sin entails. Theology writers from Paper Masters custom write each research paper on original sin to fit your exact specifications. 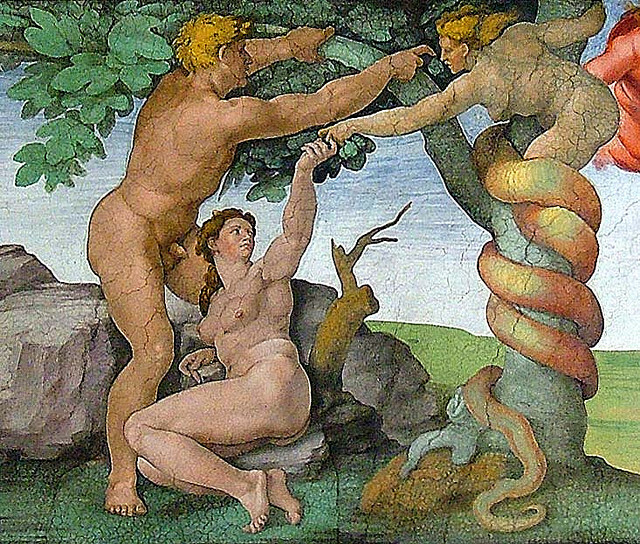 In a bible verse, Adam and Eve are tempted by the Serpent to eat from the Tree of Knowledge, thus being closer to God. In so doing, they become aware of their nakedness and hide from God in its shame. As a result, God banishes Adam and Eve from Eden, resigning them to a life much more difficult; including death, sin, working of the land, and painful childbirth. St. Paul expands on the Old Testament account by adding that all of Adam’s descendants acquire the guilt of his transgressions. These ideas are further developed by St. Augustine disputing the doctrine of the Pelagians. Augustine believed in a universal propensity for evil inherent in all human beings that could be attributed to Original Sin. This blemish on one’s soul necessitated receiving the sacrament of baptism. As such, baptism absolved the participant from past sins, including Original Sin. The Pelagians, on the other hand, believed that the sins of Adam were not injurious to the souls of his descendants. They also asserted that babies are born in a state similar to that of Adam before his sins, and as humans do not fall with Adam, nor are they raised by Jesus’ acts . The way to salvation for the Pelagians is through adherence to the Law of God and the Gospels . These are severe threats to doctrinal dogma. To Augustine, these philosophies deny the grace of God and remove the universal necessity of Jesus Christ. In response, Augustine creates sermons and books that refute Pelagianism and attempt to reassert the power of God’s grace . To accomplish this he further exposes the consequences of a human soul’s concupiscence, its natural progression toward evil. And, since we are born with Original Sin, then should we die before being baptized then the Kingdom of God will not be available to us. To support this, he quotes from Mark, “He that believes and is baptized shall be saved” and Matthew, “A person is either with God or against God (12:30).” This argument solidifies the need to baptize newborn babies. For, should a baby die before it is baptized, despite participating in no sin of its own will, its soul cannot be saved. Faerie Queene - Faerie Queene research papers discuss Edmund Spenser's classic story of the Redcrosse Knight. John Wesley - John Wesley research papers examine the Anglican cleric and the founder of the Methodist Church. Free Will - Free Will is a religious notion that philosophers such as Saint Augustine have written extensively about. Pierre Teilhard De Chardin - Pierre Teilhard De Chardin began to teach his own ideas on the original sin and evolution to his Catholic Institute classes after the Roman Catholic Church refused to publish his scientific and theological work. John Milton - The reader in introduced to Raphael in Book V and he remains with Adam and Eve until the end of Book VII. The Pentateuch - Genesis is the story of the Hebrews from Adam and Eve, through the Flood and the establishment of Abraham as the First Patriarch. Paper Masters writes custom research papers on Original Sin and delve into the Catholic definition of this term, and how it effects all the descendants of Adam and Eve.